This Comet 168P/Hergenrother photo was taken Oct. 21, 2012, by Slooh member "Dave Lrkn." Two comets are passing through the inner solar system and you can see both cosmic wanderers in the same telescope view today (Oct. 23) in a rare celestial treat. The two icy wanderers are comet 168P/Hergenrother, which has been going through some major outbursts in recent weeks, and comet C/2012 J1 (Catalina), which won't pass through the inner solar system again for the next 200 years. By a fluke of celestial mechanics, the two comets can be seen in the same telescope view, setting the stage for today's online sky show. A side-by-side view of comets 168P/Hergenrother and C/2012 J1 (Catalina) as seen by robotic telescopes operated by the Slooh Space Camera. The online Slooh Space Camera will provide a free live stream of comets 168P/Hergenrother and C/2012 J1 (Catalina) through its robotic telescopes during a 30-minute sky show that begins at 5 p.m. EDT (2100 GMT). "It’s comet fiesta time for astronomers — and the public," said astronomer Bob Berman, a Slooh commentator with Astronomy Magazine. "Here, Slooh will simultaneously watch two comets as they dramatically zoom in opposite directions in the same field of view!" Slooh president Patrick Paolucci and outreach coordinator Paul Cox will also participate in today's webcast. It will also be carried on this SPACE.com page at the event's start time. Adam Block at the Mount Lemmon SkyCenter in Arizona caught Comet 168P Hergenrother on October 5, 2012. Comet C/2012 J1 (Catalina) is a more recent celestial discovery. Astronomer A.R, Gibbs spotted the comet as part of the ongoing Catalina Sky Survey on May 13 of this year. Unlike 168P/Hergenrother, comet C/2012 J1 (Catalina) is a stable target that is gradually brightening as it makes its way toward its closest approach to the sun on Dec. 7. It is known as a "hyperbolic comet" and will not pass through the inner solar system for another 200 years, Slooh officials said. Today, two comets will appear within 43.5 arc minutes of each other. There are 60 arc minutes in one degree used to measure object locations in the night sky. Your closed fist held out at arm's length can cover about 10 degrees of the sky. Slooh officials said members of the website have been using Slooh telescopes to track the two comets regularly in recent days. The celestial line-up that places both comets in the same telescope field of view was first identified by Slooh member Maynard Pittendreig, officials said. 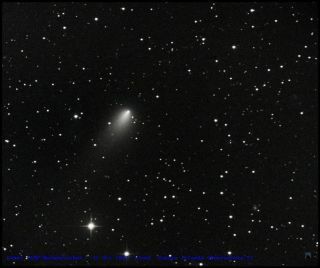 Editor's Note: If you snap an amazing photo of comets 168P/Hergenrother, C/2012 J1 (Catalina) or any other skywatching target, and would like to share it for a possible story or image gallery, send images, comments and location info to SPACE.com managing editor Tariq Malik at tmalik@space.com.